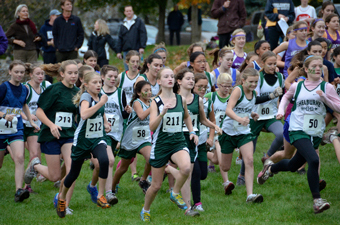 In addition to our physical education program, Vermont Commons School offers interested students the opportunity to play team sports and compete against other small independent schools and in sporting leagues in the local area and Greater New England. Typically, a majority of our students are on one or more of our teams in any given year. The primary goal of the athletic program is to foster sportsmanship, leadership, and personal growth. Student-athletes learn to balance academic eligibility with responsibilities to their teammates. The team experience is open to any academically eligible VCS student. While the objective of any competition is to win, this is secondary to the primary goal of the VCS athletic program. Most of our teams are coed, and all are open to all ages. We do not have “cuts,” but team members will be asked to maintain their commitment to the team and uphold the ideals of sportsmanship and fair play. Our team sports typically practice 5-10 hours per week outside of regular school hours. Sports and team play are an integral aspect of the Vermont Commons community, and we are strong believers in the value of learning how to balance the demands of being a student-athlete.